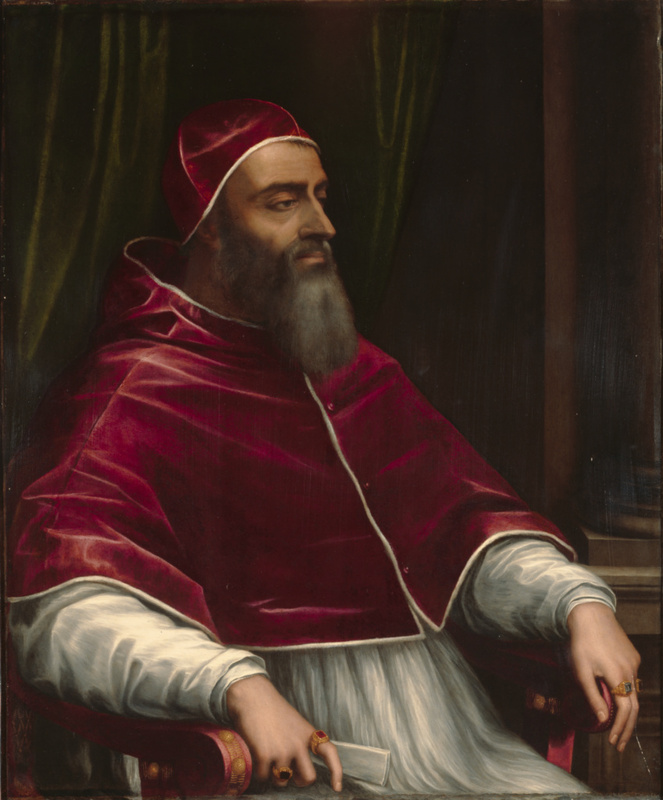 Following a model established for papal portraits by Raphael two decades earlier, Sebastiano del Piombo painted Pope Clement VII (Giulio de'Medici, reigned 1523–1534) in three-quarter length and seated in an armchair, positioned diagonally to the picture plane. In a letter dated July 22, 1531, Sebastiano told his friend and mentor Michelangelo that Pope Clement had visited his studio to see his recently completed portrait, which was painted on canvas. Satisfied with Sebastiano’s work, the pope ordered this second version for his collection, to be painted on slate. The practice of painting on slate or stone is generally thought to have begun in Rome in the early 1500s. Sebastiano had begun experimenting with stone supports around 1530, and had come to favor it for certain important commissions because he believed that paintings on stone lasted longer than those on canvas or wood. His biographer Giorgio Vasari (1511–1574), in his Lives of 1550, asserted that “pictures painted on slate last much longer than any other material.” Pope Clement evidently shared Sebastiano's enthusiasm for the support, which served to immortalize his portrait. Ironically, the stable, durable paint surface and lasting colors that could be achieved on slate were negated by the stone’s inherent fragility—especially during movement. Documents from later in the 1530s demonstrate the challenges Sebastiano faced when transporting a Pietà on slate to the Spanish patron Francesco de los Cobos, which had to be accompanied throughout its journey for fear of shattering. Pope Clement VII, Italian, 1478 - 1534 (Rome, Italy), probably commissioned from the artist, 1531. Thomas Agnew & Sons, Ltd. (London, England), sold to the J. Paul Getty Museum, 1992. Christie and Manson, London. Catalogue of the Magnificent Contents of the Mansion of the Right Hon. the Earl of Pembroke [...]. May 5-13, 1851, p. 6, lot 74 (as "Portrait of Leo X"). Christie, Manson & Woods, London. Catalogue of Capital Pictures, by Old Masters, from Different Private Collections [...]. June 1, 1861, p. 12, lot 69 (as "Portrait of Leo X"). Christie's, London. Important Old Master Pictures. December 11, 1987, pp. 222-23, lot 163, ill.
Sotheby's, Chester. Silver, Silver Plate [...] Paintings, Drawings, Watercolours, and Prints. June 9-11, 1987, p. 45, lot 4182 (as Italian School, 19th Century). "Acquisitions/1992." The J. Paul Getty Museum Journal 21 (1993), p. 116, no. 21, ill.
"Principales acquisitions des musées en 1992." La Chronique des arts: Supplément à la Gazette des beaux-arts, 6th ser., 121, no. 1490 (March 1993), p. 45, no. 216, ill.
Fredericksen, Burton B., et al. Masterpieces of Painting in the J. Paul Getty Museum. 3rd ed. (Malibu: J. Paul Getty Museum, 1995), unpaginated, no. 9, ill., entry by Dawson Carr. Mould, Philip. Sleepers: In Search of Lost Old Masters (London: Fourth Estate, 1995), pp. 66-83, figs. 19, 20. Lucco, Mauro. "Sebastiano del Piombo." In The Dictionary of Art. Jane Turner, ed. Vol. 28 (London: Macmillan Publishers Limited, 1996), p. 335. Jaffé, David. Summary Catalogue of European Paintings in the J. Paul Getty Museum (Los Angeles: J. Paul Getty Museum, 1997), p. 117, ill.
Ferino-Pagden, Sylvia, et al., eds. Vittoria Colonna: Dichterin und Muse Michelangelos, exh. cat. (Vienna: Kunsthistorisches Museum, 1997), pp. 100, 102, under no. I.38, ill., entry by Dawson Carr. Fredericksen, Burton B., et al. Masterpieces of the J. Paul Getty Museum: Paintings (Los Angeles: J. Paul Getty Museum, 1997), p. 30, no. 13, ill., entry by Dawson Carr. Reiss, Sheryl E., ed. "Clemens VII." In Hoch Renaissance im Vatikan 1503-1534: Kunst und Kultur im Rom der Päpste, exh. cat. Petra Kruse, ed. (Bonn: Kunst- und Ausstellungshalle der Bundesrepublik Deutschland, with Verlag Gerd Hatje, 1998), pp. 64, 68n111, fig. 17. Kruse, Petra, ed. Hoch Renaissance im Vatikan, 1503-1534: Kunst und Kultur im Rom der Päpste, exh. cat. (Bonn: Kunst- und Ausstellungshalle der Bundesrepublik Deutschland, with Verlag Gerd Hatje, 1998), p. 449, under no. 56, entry by Michael Hirst. Kirsh, Andrea, and Rustin S. Levenson. Seeing Through Paintings: Physical Examination in Art Historical Studies (New Haven: Yale University Press, 2000), pp. 58, 61, fig. 63. Beaufort-Spontin, Christian, ed. Kaiser Karl V. (1500-1558): Macht und Ohnmacht Europas, exh. cat. (Bonn: Kunst- und Ausstellungshalle der Bundesrepublik Deutschland, 2000), p. 234, under no. 202, entry by Sylvia Ferino-Pagden. The J. Paul Getty Museum Handbook of the Collections. 6th ed. (Los Angeles: J. Paul Getty Museum, 2001), p. 102, ill.
Collomb, Anne-Laure. "La Peinture sur pierre en Italie, 1530-1630." Ph.D. diss. (Université Lumière-Lyon 2, 2006), pp. 17, 62-63, 250, 417, 462, 555n24, 591n500, fig. 56. The J. Paul Getty Museum Handbook of the Collections. 7th ed. (Los Angeles: J. Paul Getty Museum, 2007), p. 98, ill.
Strinati, Claudio, and Bernd Wolfgang Lindemann, eds. Sebastiano del Piombo, 1485-1547, exh. cat. (Rome: Palazzo di Venezia, with Federico Motta Editore, 2008), p. 246, under no. 64, entry by Roberto Contini. Vahland, Kia. Sebastiano del Piombo: A Venetian in Rome (Ostfildern: Hatje Cantz Verlag, 2008), p. 63. Pierguidi, Stefano. "Le 'Portrait de Clément VII' par Sebastiano del Piombo du J. Paul Getty Museum." Revue de l'art, no. 160 (2008), pp. 55-59, fig. 3. Rebecchini, Guido. Un altro Lorenzo: Ippolito de' Medici tra Firenze e Roma (1511-1535) (Venice: Marsilio, 2010), p. 264, fig. 2. Daverio, Philippe. Il museo immaginato (Milan: Rizzoli, 2011), pp. 254, 259, 264, ill.
Baker-Bates, Piers. "Sebastianello Nostro Venetiano: The Career of Sebastiano del Piombo and the Concept of a 'Court Artist' in Renaissance Rome." The Court Historian: International Journal of Court Studies 16 (June 2011), p. 9, ill.
Blanc, Jan, ed. Paroles d'artistes: De la Renaissance à Sophie Calle (Paris: Citadelles & Mazenod, 2012), p. 60, ill.
Humfrey, Peter. Glasgow Museums: The Italian Paintings (London: Unicorn Press, with Glasgow Museums, 2012), pp. 88-89, under no. 24, fig. 2. Wright, Christopher. The Schorr Collection of Old Master and Nineteenth-Century Paintings. Vol. 1 (London: MGFA, 2014), p. 229, fig. 256. Hindlip, Charles. An Auctioneer's Lot: Triumphs and Disasters at Christie's (London: Third Millenium Publishing, 2016), pp. 168-69, ill.
Marciari, John. Art of Renaissance Rome: Artists and Patrons in the Eternal City (London: Laurence King Publishing, 2017), pp. 143,144, fig. 87.